So I've had this particular outfit in mind for hmmm...ever since the July Free People catalogue arrived in my mailbox. It was chock full of ladies layered in lace with floral dresses, boots and fanciful pretty things. From that eventful day on, I've been pining away for a lace bodysuit of my own. 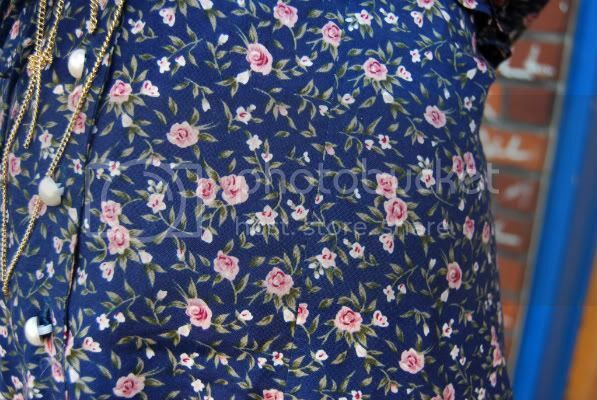 Only drawback is I wasn't completely satisfied with the chosen floral dress. It actually has sleeves and I thought I was being brilliant by tucking them away to the sides into the incorporated tie belt. Soon after though, I was left feeling somewhat disappointed by the end result. Do you guys ever do that? Try so hard to get a certain look only to feel like you've fallen a tad short? Or perhaps I'm just being neurotic and really deep down wanted to get the $48 counter version of this body suit from Free People. P.S. Check back tomorrow. I should have a lovely little DIY project for you that I'm rather fond of. Oh, and extra big thanks for all the great feedback about the previous fall fashion post. Keep 'em coming guys! i actually like the look! don't beat yourself! hehe. it looks good though! i actually LOVE the print on that dress and the lace looks fab! love those lace up boots! It looks good..but I would just change the dress. Some strapless ones would look amazing! Love this combination! The necklace is amazing with this look. I think it is a smashing look. it happens....i hate when it happens, but it does. esp. when you've got it in your mind and in your mind, it looks fabulous! Your hair looks gorgeous! And I love this look. The combo of girly lace and floral with tough ankle boots is fab. The Free People catalogs always inspire me too! 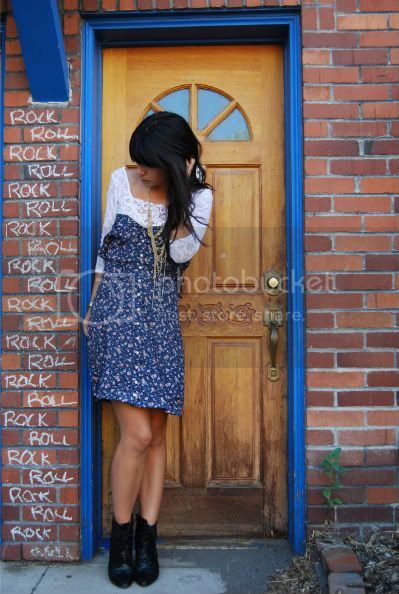 I love the lace under your dress.. and the booties are super cute!! I do that too. Plan something perfect in my head, then am disappointed with the outcome. But I do think this look is great, the pretty lace and floral print on the dress are so lovely together. I love this ensemble. Very Brick Lane, London. p.s. love the chalk rock and roll on the brick: did you do that? I love the floral dress :) What about if you just leave the sleeves up? And I know what you mean, I'm still looking for the RIGHT floral dress. It's driving me crazy. I still have yet to find that and a freaking blazer.